Business owner involvement- The businesses in town aren’t all just in it for the money. Many business owners are part of committees, boards, or attend important meetings in regards to the success of our town. This shows how involved local business owners are, their role in the community, and their connection with other small businesses. Learning this made it more worthwhile to support local business because I know that they are doing the same. EDA mission- Another thing that I have learned is that the EDA’s overall mission includes driving traffic to downtown businesses by hosting events, sharing events, and coming up with new ways to gather the community in the heart of the town. This mission means a lot to me as I know how important it is to support small businesses because they ultimately support this town. 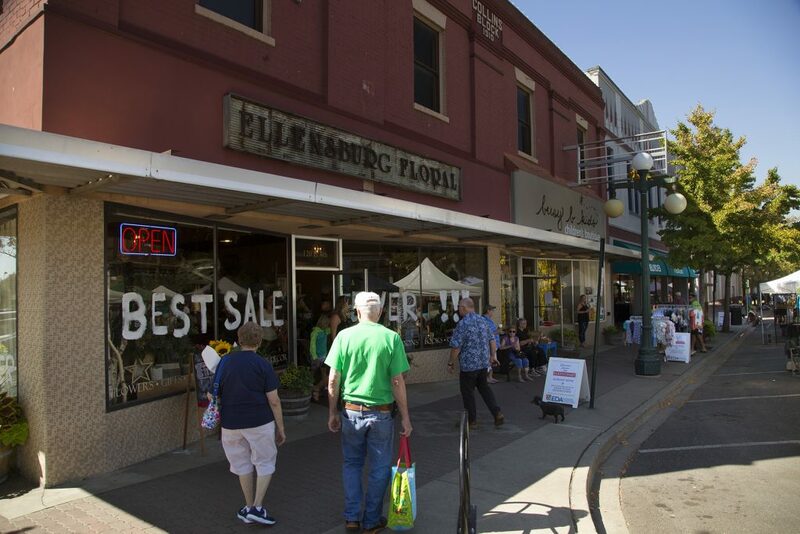 It took me awhile to understand why Ellensburg didn’t have more big box stores, but then I realized that we are already so fortunate to have the local food and retail options that exist today. My personal favorite places to eat (just to name a few) are Cornerstone Pie, Los Chilangos, Curbside on 5th and The Lunchbox Cafe. I could keep that list going, but I’ll let you venture to your next favorite restaurant yourself. Ellensburg’s reputation- Prior to moving my life to Ellensburg, all I ever heard about the town was that it’s extremely small, has nothing to do, and all there is to eat are fast food restaurants by the freeway. Oh, and there’s some sort of rodeo. Now, clearly whoever was telling me this information did not venture far enough into town to realize what Ellensburg really has to offer. There’s the obvious beauty of Central’s campus and an incredible historic downtown that has everything you could ever want out of a small town. I always tell people that if I ever move away from Ellensburg I am going to miss the food and coffee the most because I firmly believe we are spoiled with some of the best restaurants, chefs, and coffee shops! The future of Ellensburg- Considering how quickly this town is growing, there are big things happening within the next 20 years. With Central being the fastest growing university in the state, that means the town has to keep up with the extreme influx of residents. This means more housing, tourism, hotels, etc. Ellensburg is a great place to open a business. According to nerdwallet.com, Ellensburg is ranked #23 on the list of best places to start a business in Washington State. Coming in before Seattle (#34), Olympia (#40) and Tacoma (#76). Working at the EDA has given me a closer look into what it takes to start a business and I have been able to talk with people who are eager to find a place downtown to set up shop and share their passion with the world. This makes me excited for what the future of downtown Ellensburg has to come. I have much to learn while at the Ellensburg Downtown Association and I can’t wait to spend more time getting to know my community.